These are tough times for the US climate-ambulance chasers, who like to use every extreme-weather event as a God-sent sign the climate is going to hell in a handbasket. But even weather extremes aren’t cooperating with the climate predictions and models. For instance, yesterday meteorologist Joe Bastardi at Weatherbell noted that US tornado activity is near a record low so far this year. 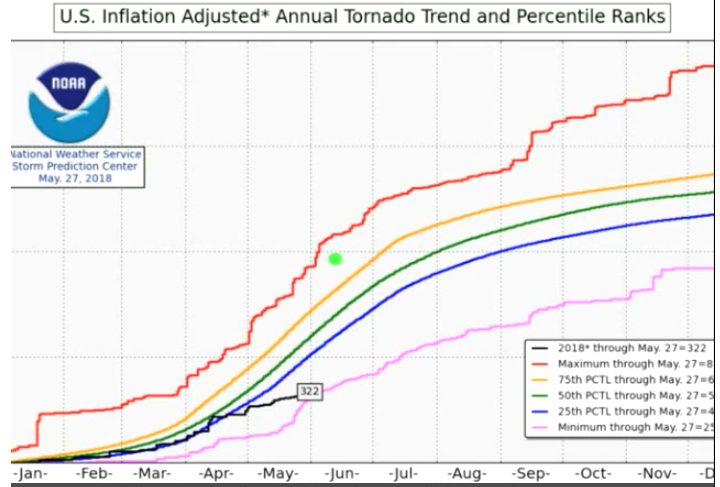 2018 US tornado activity is “well below normal” and “near a record low”. Chart: NWS. And despite claims by some US alarmist agencies of record high global temperatures occurring year after year, tornado activity over the past decades has in fact been trending downward, and so stands in stark contrast to the media and climate alarmism hysteria of greater and more frequent weather extremes. Moreover a number of meteorologists are also hinting that the 2018 hurricane season could be weaker than normal, due to unusually cool tropical Atlantic sea surface temperatures – especially off the west coast of Africa where many hurricanes are spawned. 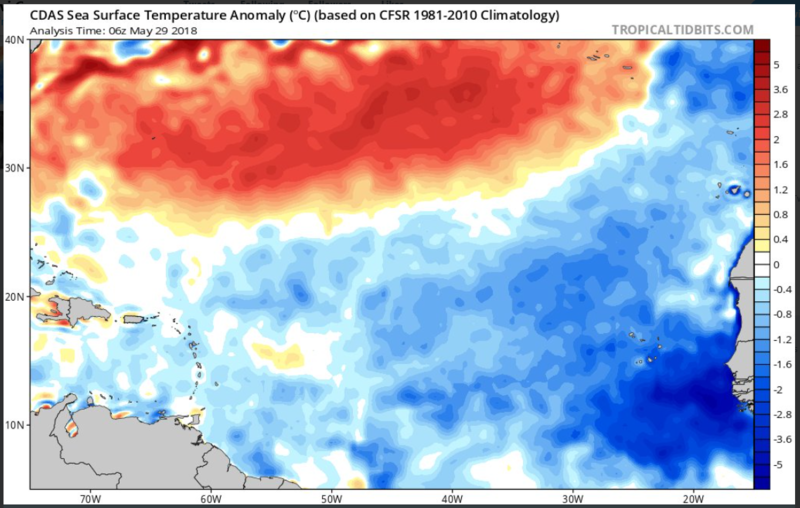 For example at Twitter Levi Cowan of Tropical Tidbits recently commented how the sea surface temperature anomaly off the coast of West Africa was “brutal”. Tropical Atlantic sea surface temperatures (SSTs) are extremely low off the coast of Africa, which may dampen the hurricane formation. Source: Tropical Tidbits. Joe Bastardi also noted in his most recent Saturday Summary that the current pattern has been seen of and on before in the 1970s, 80s and 90s, and adds that “most of those seasons aren’t big hurricane seasons”. When the Madden-Julian Oscillation enters phase 5 and 6 in June with cold sea surface temperatures off western Africa, it is indicative of lower accumulated cyclone energy (ACE) for the upcoming season, Bastardi suggests. Currently Bastardi has his ACE projection at 65 to 85% of normal. The veteran meteorologist does warn, however, of “in-close” development, where storms can form not far off US coast. Indeed it’ll be interesting to see how the upcoming hurricane season pans out in comparison to last year’s, when conditions in the Atlantic were quite different. And there’s more bad news for the climate ambulance chasers – at their beloved Arctic. 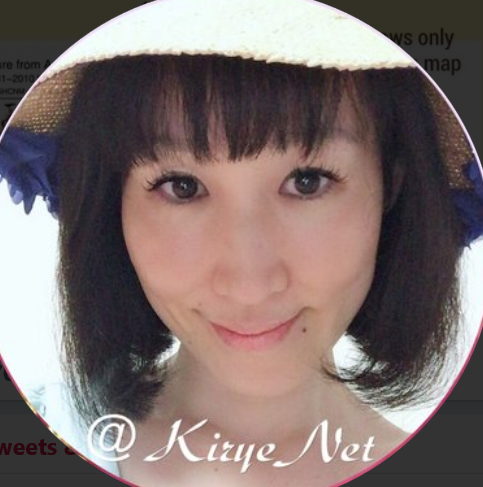 Japanese skeptic climate blogger Kirye (photo right) at Twitter recently tweeted that Arctic sea ice volume late this spring is at the 2nd highest level in 11 years! As the Arctic has seen very warm surface temperatures over the past winter, the current elevated sea ice volume tells us that there’s much more behind the ice than surface temperatures. 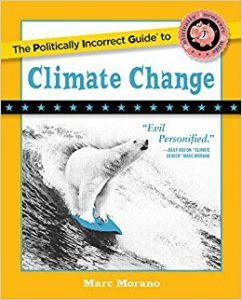 This is something we’ve been trying to tell alarmists for years. Moreover, Greenland has added 600 billion tonnes of ice, Kirye shows. So in summary, for the time-being climate alarmists will have to content themselves with insignificant weather anecdotes to keep their alarmism and climate quackery alive.